The Story: Fact-based war drama about Navy SEAL Chris Kyle. The Lowdown: Clint Eastwood's latest will please many, but it's a simplistic movie with often slack direction and little to say beyond the obvious in a print-the-legend manner. Reviewing a movie like American Sniper is a lot like walking through a minefield. Not only it is made by an American icon, but it’s about an American hero. To not like it is likely to get you branded as unpatriotic and your parentage viewed as dubious at best — and these are among the nicer things that might be said. But the fact remains that I don’t like the film, find it at best competent and often downright mediocre. In the interest of full disclosure, I am not a worshipper at the altar of Eastwood, and, yes, my politics are about as far from his as possible. Not that his politics really enter into this — except perhaps as concerns the film’s decidedly wart-free picture of Chris Kyle (Bradley Cooper). It’s mostly the fact that the film just is such a nuance-free affair — and lazily-made in the bargain. What might have been a penetrating film about the war and its after-effects becomes a standard war movie that often feels like a shooter videogame. That may be exactly what a lot of people want, but it’s less a biopic than a hagiopic. All the racist remarks and the sometimes bizarre self-mythologizing in Kyle’s autobiography have been carefully excised. The movie tells the story of Chris Kyle as played by Bradley Cooper — who we can tell is really acting here because he beefed himself up for the role so that his neck is as big as his head. (I actually like Cooper, but I’ve been more impressed with him in other films.) Kyle is, if you don’t know, the deadliest U.S. sniper of all time — 160 confirmed kills, another 100 probables. The film opens with him on a rooftop on the edge of making a call on whether or not to shoot a young boy with a grenade. Instead of following through on this, the film enters into a lengthy series of flashbacks to establish Kyle’s background — from his hunting, strict God-fearing, never back-down-from-a-fight upbringing to his attempts at being a cowboy to his enlistment and training as a SEAL to his marriage and deployment. It is economical, I suppose, but it’s also incredibly simplistic. Kyle doesn’t so much have a meet-cute with Taya (Sienna Miller) as a meet-corny — amidst lots of Jameson Whiskey product placement. (And I may be in the minority, but I find the scene where Kyle makes an impossible shot — blowing away a snake — and explains his improved marksmanship with, “I’m better when it’s breathing,” a little chilling.) At the end of all this, the film finally gets back to the rooftop and its grim, but rather matter-of-fact conclusion. Right here, the film has established its basic war picture approach. Before it’s over we’ll even have someone getting a “dear John” letter — so much is the film in WWII movie mode. It quickly becomes a series of largely undistinguished battle scenes — tied to a wholly fictional running battle between Kyle and a character named Mustafa (Sammy Sheik) — interspersed with trips home between tours. The first of these finds Kyle getting there in time to see his wife give birth to a laughably bad rubber prop baby. (Not content with using this careless bogus baby once, Eastwood gives it a second scene.) The point of these trips home seems mostly to be to establish how withdrawn from the normal world Kyle is becoming. That last is certainly where the film should score its points, but not only does it have nothing fresh to say, it becomes glib once Kyle comes home for good. Yes, he’s suffering from PTSD. But, hey, the movie’s winding down, so he finds help for himself in helping other veterans in about 10 minutes of screentime. All of this leads to the most abrupt, perfunctory endings imaginable — with the most heavy-handed foreshadowing possible. In case — though it seems unlikely — you don’t know, read no further. Kyle was killed by an ex-Marine he was trying to help reconnect with the world — something that occurred during the movie’s development, and which may have dictated the tone the film took. It is also something the film deals with via an onscreen title, which feels abrupt, awkward, and just not enough. Actually, that sums up my feelings about the whole movie. Rated R for strong and disturbing war violence, and language throughout including some sexual references. Having been in Nam one might think I’d be part of their demographic, but I have no interest in this sort of thing any more. We ask too much of these guys and then pretty much abandon them when they return. It may be a necessary job at times but there’s nothing glorious about it. Now that he’s dead a load of couch potatoes get to call him vile names. Hagiographys are equally repulsive and serve no one. I don’t know the truth of it all. But neither does anyone else including Clint Eastwood. I suspect I am the one most likely to be called vile names here. Eastwood’s movie is super non-critical of the man. I suppose I shouldn’t be surprised by the nominations, but I can’t say I ever expected the film to gross 70+ million opening weekend. That’s insane. Great news for film lovers though. Cinema is not dead! You could make the exact same claim using Transformers: Age of Extinction and the reality wouldn’t shift an inch. Yes, this was more than distracting. Additionally we’re able to pick out RumChata liqueur and Fireball Cinnamon Whiskey on the shelves, neither of which were around at the time the scene takes place. I was so appalled by that point that I never even thought of that little problem. Maybe I was just too excited by the prospect of seeing that rubber baby. The nondescript bottle of tequila from the set of Your Sister’s Sister woulda played better than either. Those who know me can verify I am left of center but politics be damned, I thought the film was good. It’s not going on my top ten list and I’m not sure it’s worthy of a best picture nomination (Fury, being a better war movie could have taken that spot.) but I thought it was a good story about a man who wanted to serve his country. War is hell and I hate the powers that be for sending brave men and women into profitable conflicts and treating them as cannon fodder. This is a film not a documentary and I thought it was done well. Yes Ken I do agree that ending was rushed, I was wanting to be introduced to the killer and find out what happened and why. Maybe they didn’t know. J. Edgar was a far better film and should have recieved the Oscar acclaim that this one is getting. In regards to recent Eastwood films. I don’t know that politics enter into it. I mean, sure, it plays like red meat to the red state-minded, but it also does this in part by leaving out all sorts of things about Kyle that the man put — consciously or otherwise — into his own book that this is based on. It may be “a good story” (as you put it), but it’s a terribly whitewashed one. That to one side, I think it’s just — at best — a truly mediocre film designed to play on very manipulated emotions. I’m not just talking about the very end of the picture being rushed, but the whole PTSD business is absurdly abrupt. Of course, that’s the stuff people don’t want to see examined, so it’s hardly surprising. I agree that J. Edgar was a better film, but I have never bought into the idea that Eastwood is a great filmmaker. He is no Kubrick, Chaplin, or Gilliam but he has made some fantastic films. Unforgiven, Million Dollar Baby, Invictus, and half of The Changling (the mother story was a bore but the part about the “Chicken Koop Murders” was a fascinating insane true story that rivaled the Texas Chainsaw Massacre) American Sniper is good not great. The heart of the movie was a story about a man who feels lost and wants to do something noble. White washed?? Probably. I must admit that during the screening I kept thinking of Enemy at the Gates, a superior film about snipers. I’ve never seen Unforgiven, but I think Million Dollar Baby is the most embarrassing Best Picture winner in Oscar history. Invictus was what I call a “four star forgettable,” which is to say I gave it four stars and now remember almost nothing. Changeling (no The, that’s something else) was okay, but nothing great. Let us say that your reading of what American Sniper is and mine diverge a lot. It’s not a question of whethere it’s whitwashed. There’s no probably about it. It is. Kyle makes racist remarks in his book and tells outrageous lies about his post-war self (like shooting two car-jackers and the police patting him on the back with no charges filed) that no one backs up. These things are carefully omitted from the movie. A more embarrising win than 2005’s Crash?? Whaaaaaa?! I see your point. I only knew of this man from the film and all the Oscar press. Yes, I’d call it more embarrassing than Crash. One thing everyone can agree on………. The most fake looking baby ever! And he uses it twice! Ha, did anybody see this? Amen to that. That is one movie I truly wish I had not seen. If I even think about it, I get a bit depressed. Who play Jesse Ventura in this? 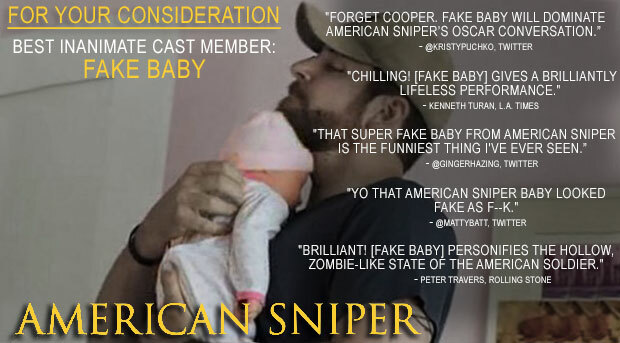 I have no desire to see this film, but I have been keeping up with the fake baby debacle, how bad is it realy? One of those large jars of apple sauce wrapped in a blanket would have only been slightly less convincing. Actually they may have used the same baby from We’re the Millers. Mr. Ventura does not appear — like a lot of other things about our hero, he is conveniently not mentioned. The fake baby…well, it reaches its apex when Bradley Cooper tries to animate it by wiggling its arm with his thumb. Not since Bela Lugosi’s stunt double wrestled with the rubber octopus in Bride of the Monster has cinema given us such a moment.